Tango Argentino has been in my life for almost 10 years. I stumbled over it by pure chance and against all expectations. If a time traveller would have visited my past self to tell her that one day she would dance tango, she would have laughed herself silly. I was never into sports and when the local dance school in my hometown was sending out their enrollment forms I hid the form so that my parents wouldn’t have a chance of enrolling me against my will. No, tango took me completely by surprise. It was probably the unlikeliest thing to ever happen to me! My life changed when I enrolled in a university course about the media representation of tango argentino as part of my Media and Cultural Studies degree. It was a random course to choose, but so would have been many of the other courses offered that semester. I was really rather skeptical about my choice and definitely didn’t expect to be falling into a lifelong commitment bordering on addiction! At first the course confused me. It was a rather unusual course that reflected on the history and experience of tango in relation to the rather clichéd representation of the dance in movies and print media. We watched a number of tango movies, went to some tango concerts and I read some books on the history of the dance and the music. For a while I just couldn’t understand my lecturer’s obvious obsession though, it just didn’t make any sense to me! So, one fine day I talked a friend of mine into joining a tango class with me. I just needed to understand and tango can’t be understood in theory. It has to be experienced! Within just a few weeks my entire existence was taken over by tango. I went dancing at least 2, sometimes 5 times a week and spent many nights dancing 6h in a row until my feet were hurting so much that I couldn’t continue. It’s unsurprising that I hardly managed to keep up with my uni work in that semester (except for my tango course obviously) and walked around in a state somewhere between exhaustion and bliss after a great many nights with very little sleep and lots of dancing. 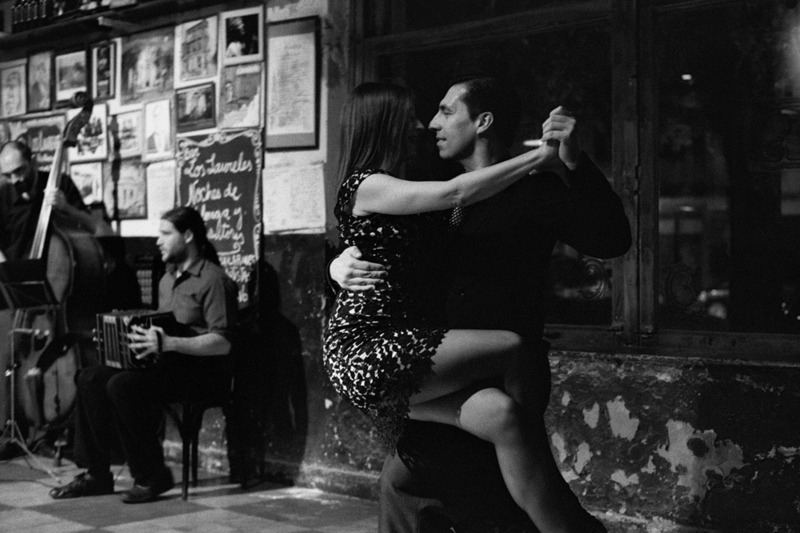 Tango is much more than a dance actually. The music is incredibly rich and there is a vast culture and even a whole industry surrounding the practice of tango. Almost everywhere you go, from Tokyo over Moscow, London, Sydney and New York to Berlin and Buenos Aires, there is a community of tango dancers who teach, organise milongas - the events where tango is danced socially - play in tango orchestras or just spend every free moment dancing. Even in smaller towns like Brighton or York (UK) I found little communities of dancers. Additionally many dancers also travel internationally to dance at tango festivals or take classes with famous dancers. When I first started with tango I was surprised about all the places where one could dance tango. With my tango shoes in my bag I explored the city where I had lived for quite a number of years and to my surprise there were milongas in all sorts of unexpected places. It was as if there was a hidden parallel universe out there, invisible to everyone without dance shoes in their bag. There is nothing quite comparable to the experience of searching for a new address of a milonga where you have never been before and knowing that you’re getting close because you can already hear the music from afar. Your step quickens in anticipation and you open a door, step over the threshold and find yourself in a different world. It’s quite magical. For many years tango was the nucleus of my life and I continued to go dancing 2 to 5 times a week during this time (during crazy periods it might have been more). Most of my friends were tango dancers and my life was built around catching any opportunity to dance tango, even while I was living in places with only small tango communities. I spent hours in cars, on buses and trains late at night to get my tango fix. I biked and walked many kilometres when all other transport failed and even got stranded in strange towns once or twice. I never travelled without my tango shoes and eventually I even moved to Berlin, all because of tango. However, tango can be difficult too. Getting this close to strangers can create many awkward situations, especially with beginners who haven’t quite understood the emotional complexities involved in dancing socially. Many tango dancers can also get obsessed with technicalities or spend most of their time showing off, which is the opposite of my personal dancing preferences. And although tango kept me sane during difficult times - for example when I was writing my BA thesis and my MSc dissertation - it also drove me crazy during other periods. Many evenings I was just hoping to find a little 3 minute connection with another human being and all I found were people who were only dancing with the audience in mind. During such times tango made me angry and caused me lots of frustration, which ultimately led me to dance less and less, especially in Berlin where the community is big, impersonal and rather narcissistic. Also my health forced me to slow down eventually and finally I had to stop altogether. Yet, the tango obsession always remained. For several years now I have been trying to rebuild my health and over the last year I’ve slowly started to dance again - I’m a tango addict after all, there is no cure for that - but I’m still quite far from being able to fall back into my old tango patterns. Not being able to dance made going to milongas to meet my tango obsessed friends always a little sad. However, on a recent trip to Buenos Aires I finally found another way to banish the blues and enjoy going to milongas again: I now take my camera with me! All photographs: Leica M6, Voigtländer Nokton 50mm f/1.1, HP5+ pushed to 800 in Rodinal stand. Film enthusiast Lilly Schwartz is a European street photographer. Connect with her here on our website, and on Tumblr.